Entrance hall is a space that accompanies us every morning and meets us in the evening. This is the first space that sees everyone who comes to our home. Hallmark, the first impression, the very same “hanger” where everything begins. 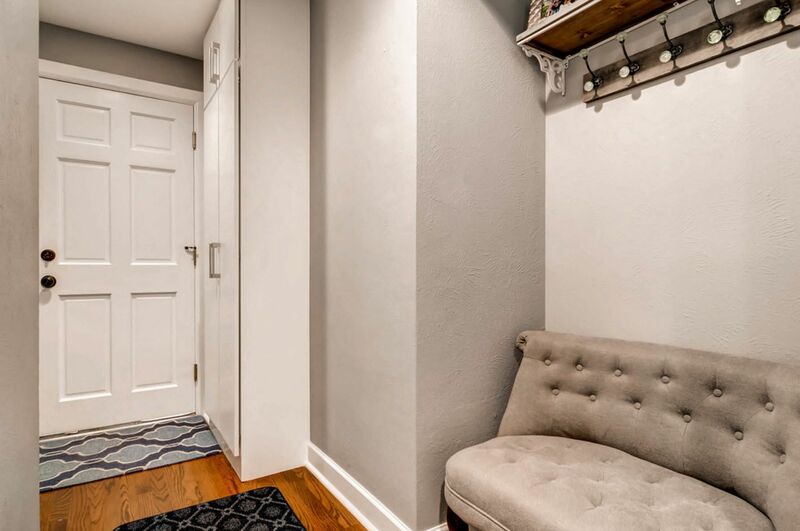 That is why any owner of an apartment or house wants to see his hallway comfortable, practical, functional, fashionable, and made in the general style of the whole house. But most of the hallways in old buildings have such modest size that we need to cut out not meters but centimeters of useful space. But it is possible to create a comfortable, aesthetic and modern design even in small utilitarian spaces. We need to stay up to date along with entrance hall design ideas 2017. Photos, real examples, decoration advice that you see at the current article, we hope, will help you to decorate your apartment not just in functional but also most trendy fashion. Often halls have small size, irregular shape and, of course, they’re not equipped with a source of natural light. All these features directly dictate the choice of not only the color palette design, stylistic trends, but also the choice of materials for decoration and furnishing models for the arrangement of the room. Hallways of private homes are usually more spacious, often have a window (at least small one), but their load in terms of exposure to contamination is even higher than their “apartment” analogues. After all, all households went back from the street (bringing snow, mud and wet sand on the sole, and moisture on clothing and umbrellas) directly into the hall, they do not need to pass a few flights of stairs at the entrance. If we talk about the design of the hall in terms of practicality and ease of operation and maintenance, the first rule is to use the water-resistant materials that are easy to care for. You must also take into account the higher risk of mechanical damage, given that the hall takes on not only moisture and dirt from our soles, but the weight of large purchases, traces of studs and heels, drops of umbrellas, rollers and even sleds. To a large extent, these types of impacts cause the choice of flooring. 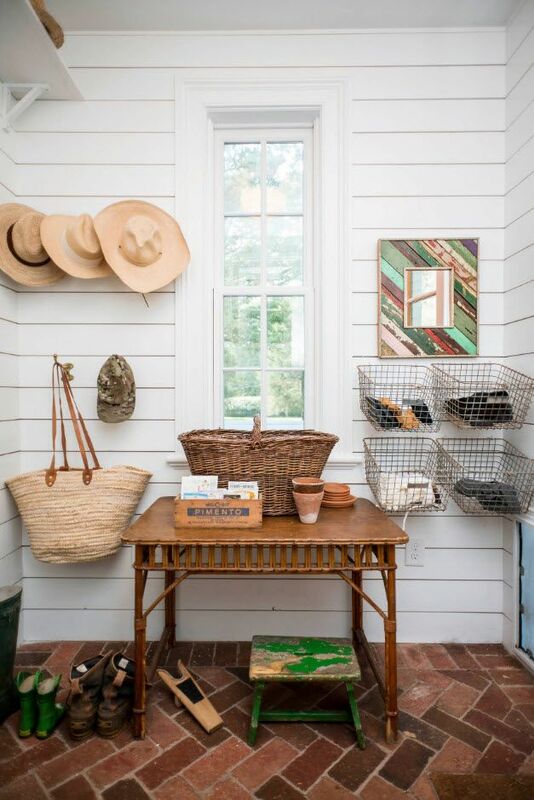 In terms of hallway stylistics, we can only speak about one important rule – it must harmoniously integrate into the overall picture of the performance of the entire home, and not be opposed to it. The hallway is under power to create the right mood, show the character of the interior of an apartment or house. Even if all of your home is decorated in classic style, and the hallway just has no place for the stucco and luxury furniture, you can use a neutral (minimalist) tone in the design, adding a so-called coupling elements – beautiful mirror in a luxurious frame, chandelier or wall sconce with a rich decor. Experts do not recommend experimenting with the mixture of styles in this modest sized and complex in terms of providing comfort room as the hallway. The modern style is perfectly suited for such premises. 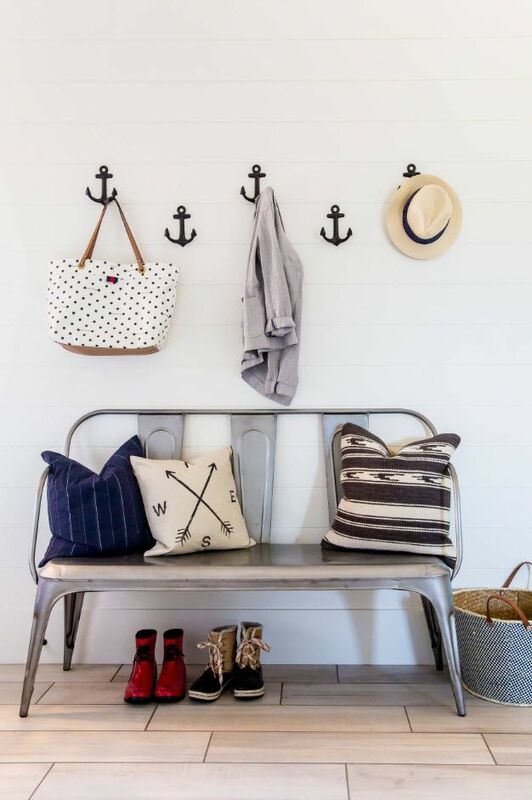 The desire to get rid of all the excess, to minimize decorating and ascend personal comfort at the forefront – all these trends of modern style are literally made for hallways, with their complicated functional overtones. The hallway has not only its special microclimate, location in a house or apartment, but also the functional directionality. All these aspects must be considered when choosing the finishing materials for all surfaces. 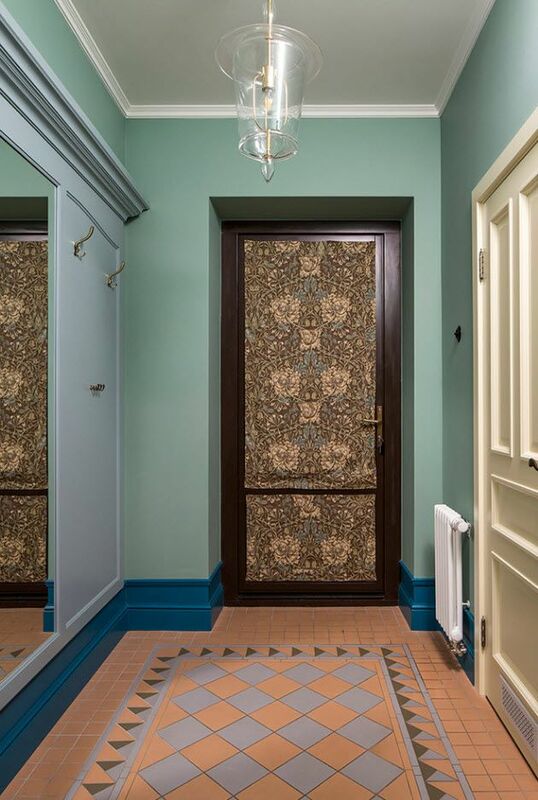 To hallway could bear moisture, dirt, dust, sand, heavy bags, sharp objects, constant traffic decently without losing its stylish image, you must carefully choose the finish. Let’s start with the ceiling. In the hallway we don’t expect harmful influences, so essential restrictions on the choice of finishing materials do not exist. But experts recommend choosing the simplest and most universal solution for the preparation of modern design. Perfectly smooth white ceiling is the key to success in design of the hall. Sophisticated duplex structure of false ceilings, relief decoration or bright tone is not options regarding small size of the room. 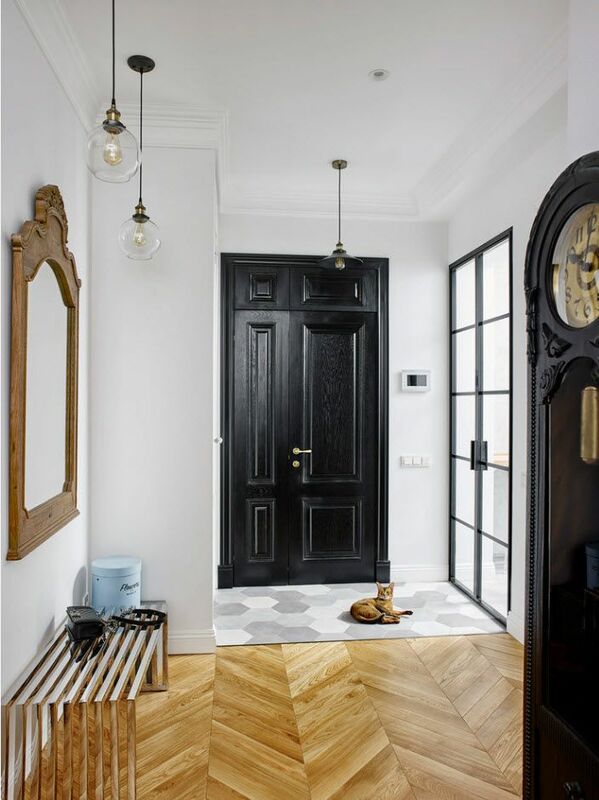 In order to make transition to the rest of the rooms from the hallway (and in some apartments it is the utilitarian premise being an entrance into completely all the other rooms) was smooth, organic, – the whole decoration of the space should be neutral. Perform of the walls finishing in the hallway is necessary, taking into account the peculiarities of this highly loaded space. Moisture, dust, dirt and mechanical effects are the main threat to the vertical surfaces. Therefore, we can safely exclude paper and textile wallpaper from the design options for the walls in the hallway. But wall panels are becoming a more common way of practical and aesthetic finishing of the walls. These panels can be smooth and textured, plain and patterned, imitate wood, stone, brick or ceramic. Experts assure that ceramic tile has all these qualities. But in addition to the above properties, ceramics is either one of the most durable materials for flooring. Of course, such a floor is not the cheapest option (taking into account that you’ll have to spend money not only buying the tile and adhesive, but also to the laying process), but the long-term operation, beautiful appearance and ease of care will compensate all costs. 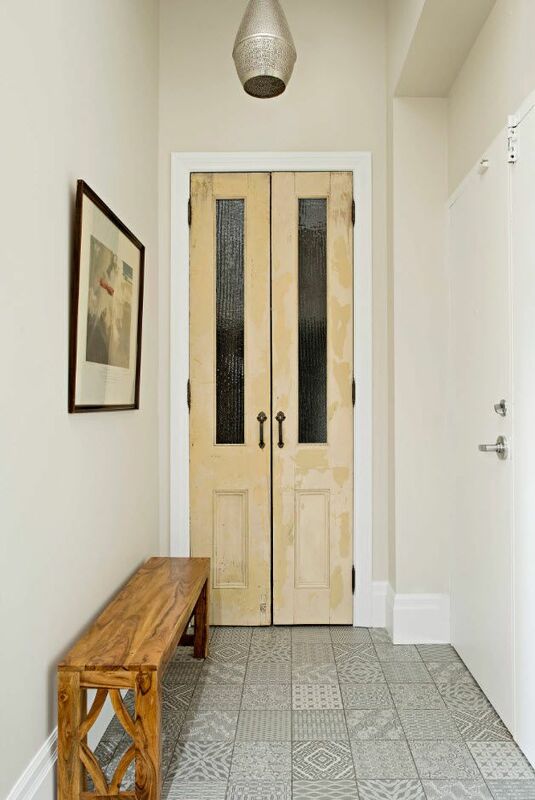 In a private home, it is better to perform the entire hallway floor finish by means of ceramic tiles. And in the interior of the apartment flats or studios, you can resort to combining. Space at the front door can be trimmed with ceramics, and then use laminate flooring or linoleum, matching a color solution. Also, designers recommend the use of tile as a material to create so-called plinth panel. On a wall (for protection against dirt and moisture) tiles (usually the same as that used to create the floor covering) are glued in a row. If we talk about the color palette of finishes in the hallway, the experts strongly recommend choosing warm, bright colors. In Europe for example recently there was a certain tradition of use of dark, depressing tones in finishing the hallways. Many designers had motivated his tradition such color palette by very high risk of contamination of surfaces in the hall and bright colors are simply inappropriate here. But modern materials can be cleaned with a damp sponge using a cleaning agent that will not harm surfaces. Herewith, same bright colors will not only help to visually enlarge a small room, but also to create a light, clean and elegant image of the space, which is the first on the way of acquaintance with your home. It’s hard to imagine a comfortable hallway with no storage for clothing, footwear, umbrellas and other accessories. 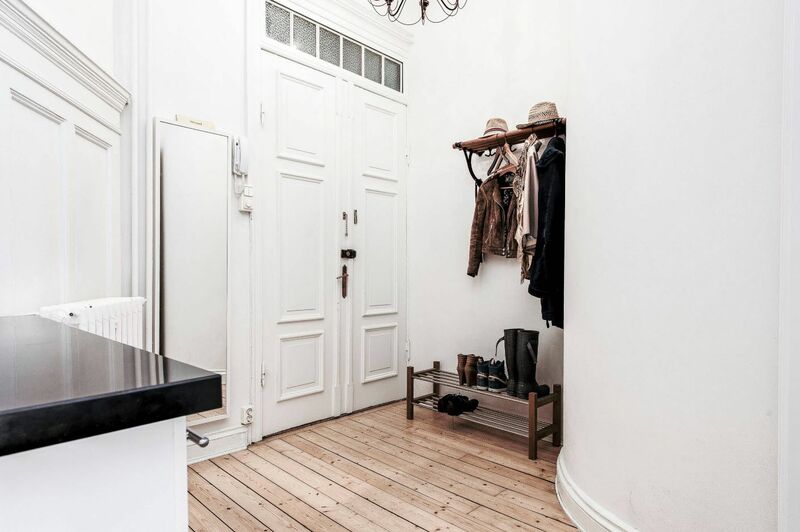 Even in small hall, more like a narrow corridor, it is possible to build a shallow rack with hooks for clothes. For couples living in the apartment, it will be enough of a compact cabinet, or a pair of hooks and footwear shelving. Large families need more storage. 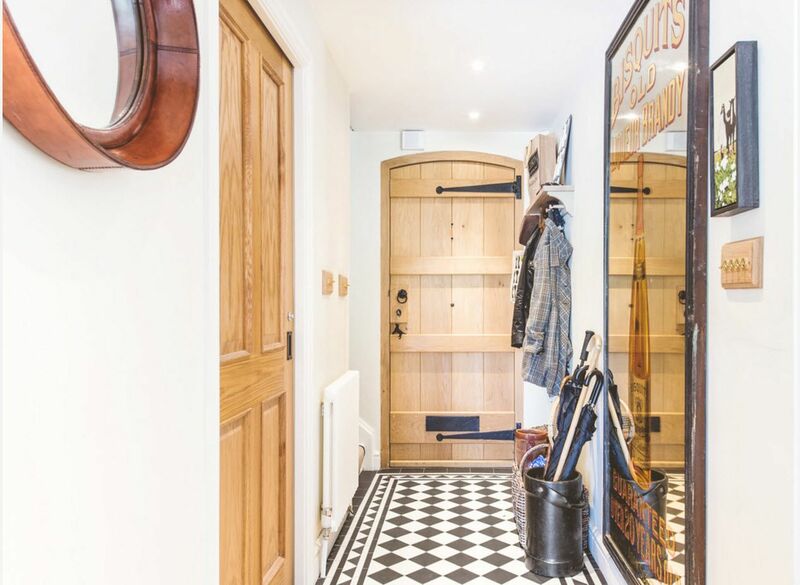 Built-in wardrobe and floor-to-ceiling cabinet will help to solve the problem of storing seasonal clothes and shoes, as well as will allow keeping in the necessary daily accessories – umbrellas, gloves, sports equipment – on hand. 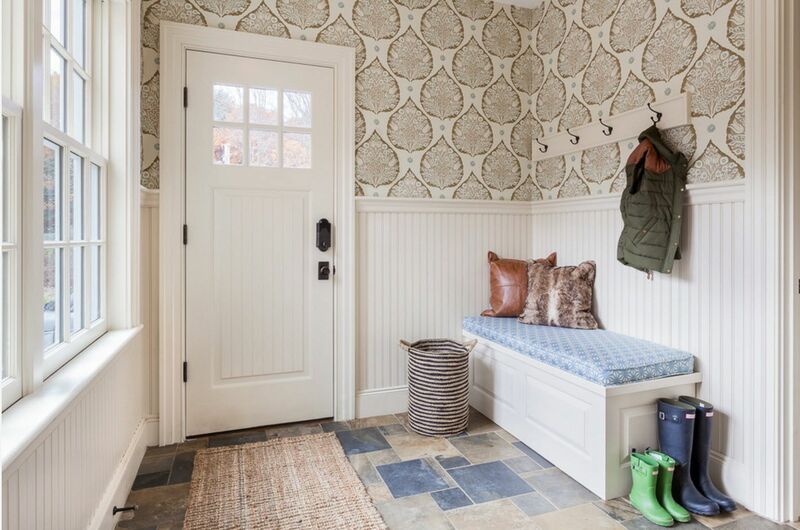 If the hallway space allows, a hanger is convenient to install a small banquette or integrated seat. Soft padding allows conveniently change one’s shoes, and the space under the benches can be used for shoes’ fitting. With this layout, you can be sure that every centimeter of the hall is used rationally. If the hallway space does not allow embedded storage system, you need to take care of, at least, of a sufficient amount of hangers. It may be conventional hooks that are attached to the walls. In this case it is necessary to take care of the protection of surfaces from moisture, which is brought back from the outside on top of clothing. In this case, the best option will be the finishing wall panels. If the hangers are attached to the surface of the laminated or multiple racks, then the walls protection measures can be weakened and use vinyl or liquid wallpaper, decorative plaster. What colors to choose for the performance of the storage systems in the hallway? Designers recommend a stop at the light wood species with warm natural pattern, if you use white tone for finishing most surfaces. The warmth of natural materials will raise the degree of the color temperature and create more comfortable look of facilities. After all, the use of white hues in large quantities can create a sense of not only ease but sterile space. Such an interior needs accents and a wood furnishing of bright, but light colors is able to cope with this task. Another universal design helper of furniture production for small spaces is white color. If the walls of the hall are decorated in pastel colors, the white furniture would harmoniously join the creation of easy and elegant appearance. In addition, when embedding storage from floor to ceiling, it turns out very large-scale construction. White color helps to minimize the feeling of massiveness, monumentality. If your hallway is in a private home or apartment with an improved layout and can boast of a large area, the choice of color for the furniture execution is incredibly large. Composite shades of blue will be popular in the new season. Beautiful shades of blue can be used both in the finishing and in furnishing of the rooms. 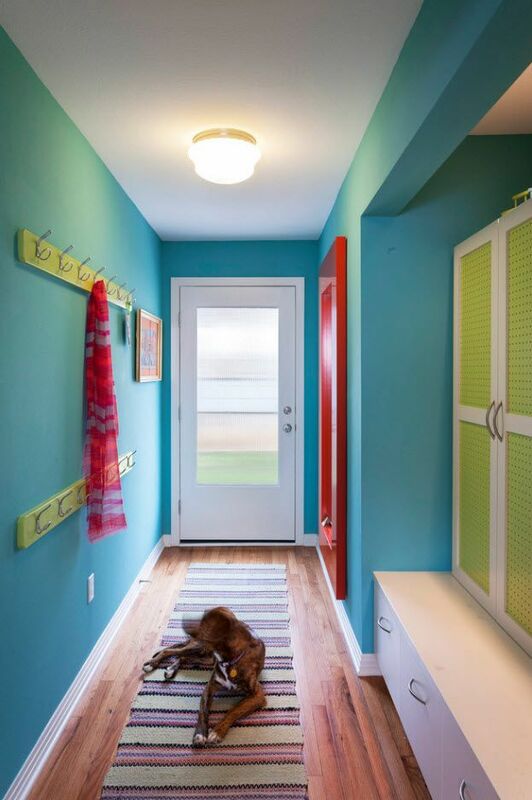 But it is logical to leave the finish wall in light shades and colorful scheme leave for storage in the entrance. So popular in the last season, gray is one of the favorites in the new season too. Different shades of neutral colors fit perfectly into any interior, do not attract too much attention, but do not get lost in the overall picture of the room. Noble shades of gray in the performance of the furniture perfectly set off by white walls and mirrors’ shine, chrome-plated surfaces accessories, lighting. The room with no windows (and in apartments we can rarely find other options of hallways’ performance) requires focusing on the lighting system. Experts recommend not be limited to a single central lamp and create spotlights, i.e. use of several sources of artificial light. It can be the ceiling lights built on the perimeter, or a combination of a central chandelier and wall sconces. You can also use lighting around the mirror (reflected light will be multiplied). Is successful decoration possible in such a modest room size? Of course yes. Functional components of the interior (lighting, for example) can act as decorative elements. If your hall does not have a large area, but it can boast with high ceiling, it is possible to decorate its appearance using the original chandelier. Otherwise, try to focus on the wall lights. Neither entrance hall is complete without a large mirror, as we need to see in what form we leave our home in the morning and start a new working day. 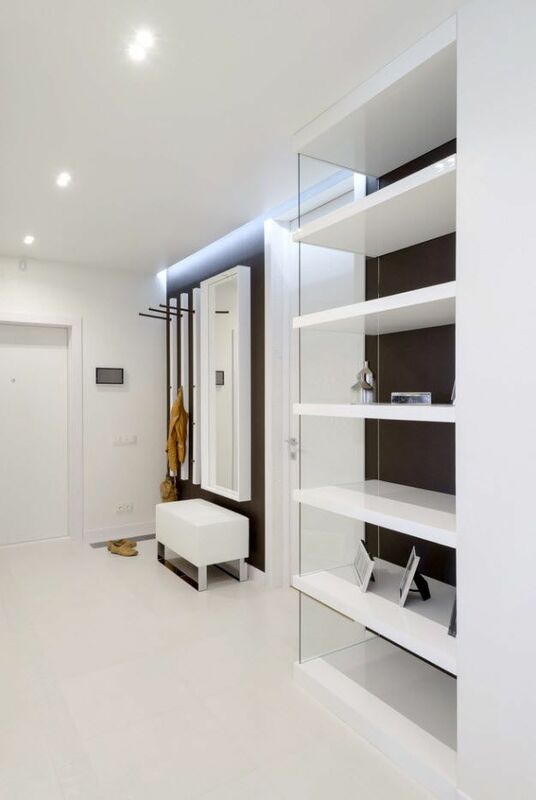 Mirror in utilitarian space is necessary also because of the possible visual increase of the room. And with the help of the original mirror in a beautiful or unusual frame, you can decorate even the most modest and mediocre hallway. In the small sized room you can use​​ bright color as a decorative element. If space is decorated in light, neutral colors, it is enough just adding one colorful interior element to radically alter the character and mood of the hall. This may be part of the decoration, the front door or bright hanger, ottoman for putting on footwear or basket for umbrellas.